With Shrove Tuesday, more affectionately named Pancake Day, coming up, we wanted to share our favourite pancake recipe with you. 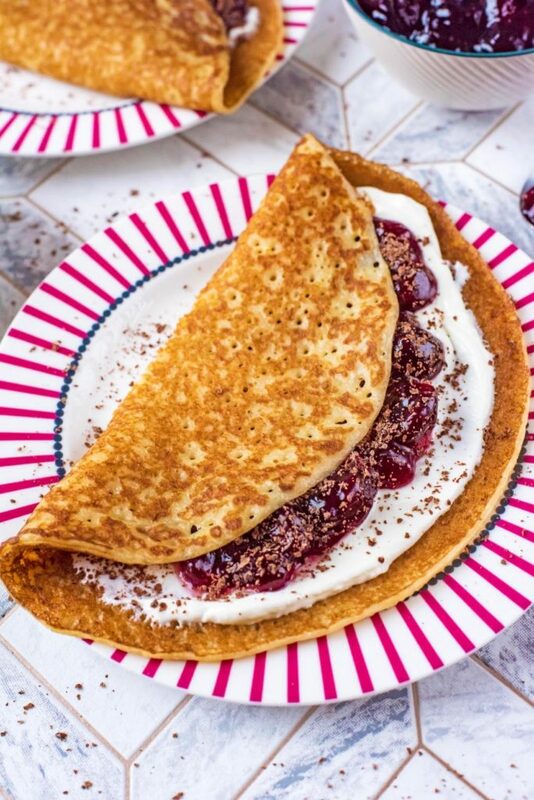 Pancakes here in the UK are more like crêpes and chocolate and cherry are the perfect topping in these Black Forest Pancakes. A Sunday morning deserves pancakes and if you follow us on Instagram you will know that Pancake Sundays are never missed in our house. 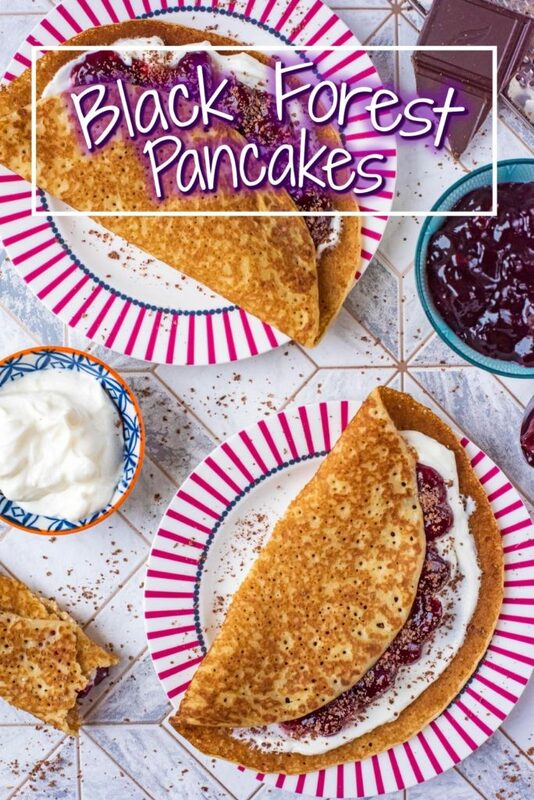 There is just something about a lazy Sunday morning family breakfast that we love and these pancakes are perfect for that, and for Pancake Day. 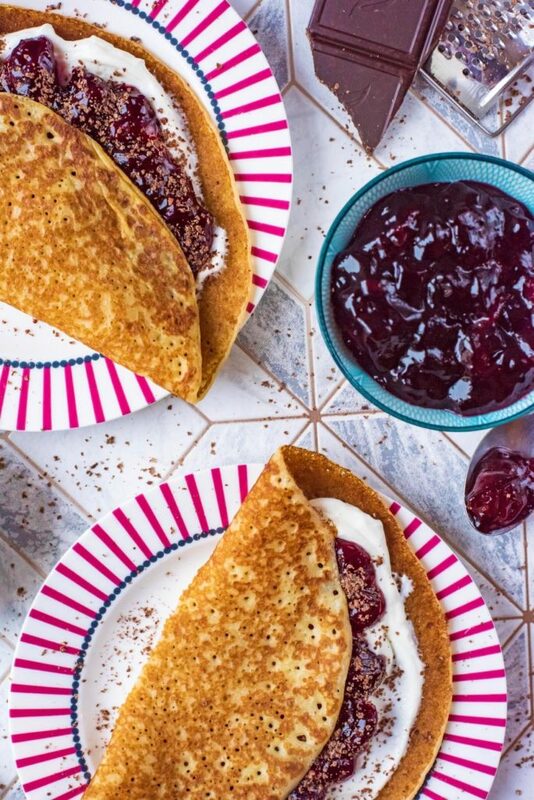 Do you want to be kept up to date on more delicious and healthy recipes like these Black Forest Pancakes? Please subscribe to the blog mailing list (it takes 30 seconds). You will get sent the new recipes straight to your inbox. Your email address won’t be passed on to anyone and you will never be spammed. I love Black Forest Gateau – it’s pretty much the best cake there is. I also really love pancakes – pancakes are pretty much the best breakfast item there is. So…. why not combine the two and make them a little healthier at the same time? This was an indulgent breakfast that wasn’t even that indulgent. It will also be going on the dinner table on Shrove Tuesday, because it’s pancake day! 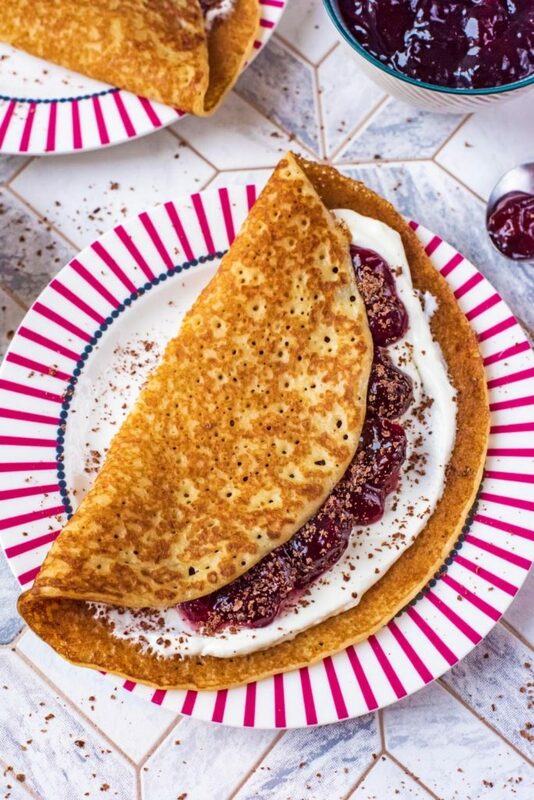 I know some of you might refer to these as crêpes, but in the UK these are our pancakes, and I actually prefer them to American style pancakes, as they feel a bit lighter. Sorry American friends! If you live in a part of the world that doesn’t celebrate Pancake Day, then firstly, you are missing out. But, if you didn’t know already, Pancake day is something we have celebrated in Britain for centuries. The date changes every year, because Easter changes, but it’s always the day before Ash Wednesday, which is the start of lent. Why do we eat pancakes? Well, traditionally it was to use up indulgent foods like milk and eggs before 40 days of fasting. It is also thought to be a pagan tradition with a round pancake symbolising the sun and the beginning of spring. I am not an overly religious person (more spiritual), but I do like to challenge myself to give things up, so I take part in lent. I am not going to do anything extreme (extreme to me) like give up sugar or wine, but I am going to give up a few things. The first thing I am giving up is negativity. I want to be more positive in everything I do – this includes positive body image, positive about my ability to do things and also positive towards the people around me. I am giving up late nights so I can get my sleeping pattern a bit better (as much as I can with a toddler that doesn’t sleep). Finally, and more food related, we are giving up takeaways. We don’t eat them very often, every 2 weeks or so, but we are cutting them out. Are you giving anything up for lent? We had a bit of a treat with this and topped it with some cherry pie filling, but you could always make your own cherry jam, or just top it with some fresh cherries. We used 0% Greek yoghurt instead of cream to make it lighter and just grated a little dark chocolate on top instead of adding loads of chocolate chips or chocolate syrup. I used half plain flour and half wholewheat flour too. 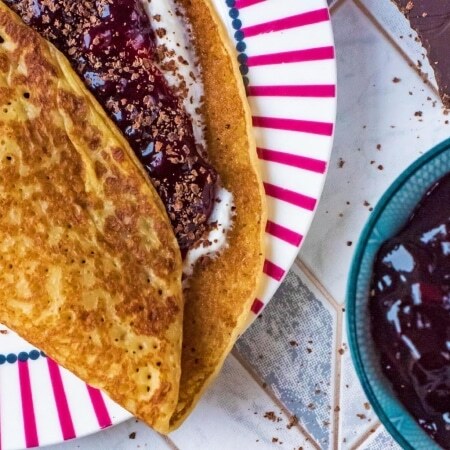 You don’t get a much better flavour combination than cherry and dark chocolate, and these pancakes are light but super tasty. 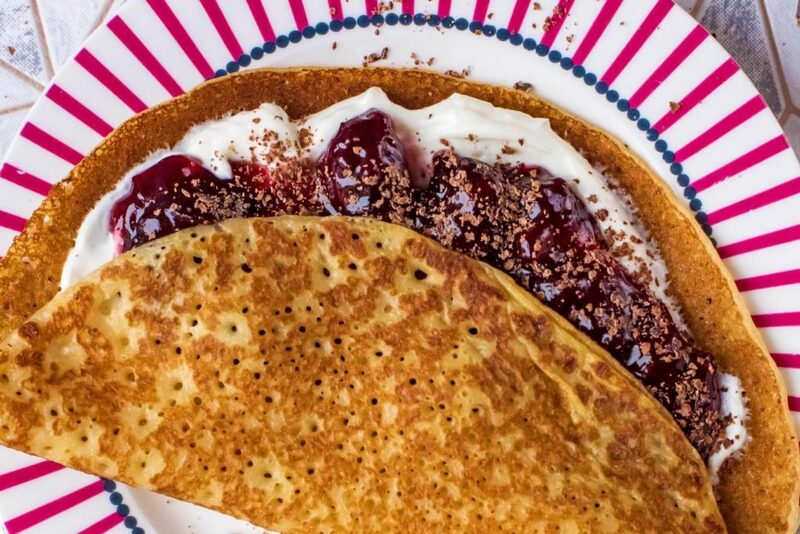 You could even change it up and use a raspberry jam and some white chocolate as a pancake day alternative. 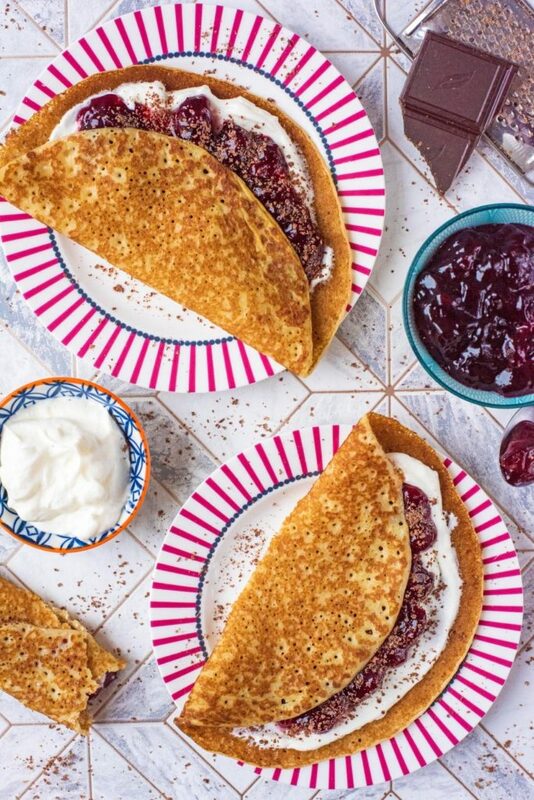 Pancakes here in the UK are more like crepes and chocolate and cherry are the perfect topping in these Black Forest Pancakes. Add the flour, milk and egg in to a bowl and whisk well. Set aside for 2 minutes until ready to use. Spray a pan with a little oil and then pour in a quarter of the mix and cook the pancakes on 1 minute each side. Repeat to cook all 4 pancakes. 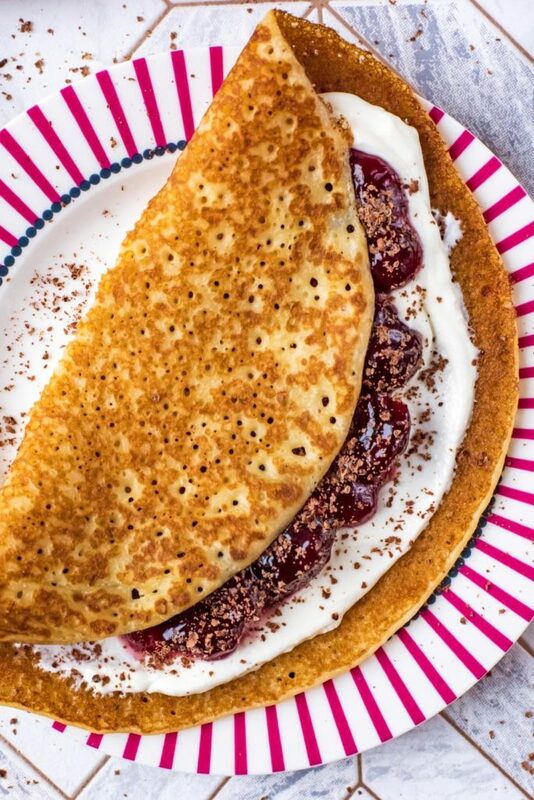 Fold each pancake and then top with Greek yoghurt, cherries and sprinkle with dark chocolate. We have some other great pancake recipes too. Try our Apple and Granola Oat Pancakes, Coconut Pancakes, Wholewheat Pancakes or maybe something savoury with our Caramelised Onion and Cheddar Pancakes. Black Forest Pancakes, when I saw the pic I just had to click on this article. They really are impressive!! These are going to make a great Sunday breakfast. Beautiful. Black forest is one of my all time flavor combinations! Sign me up!